Rogier van der Weyden’s portrait of Charles the Bold doesn’t do justice to Charles’ infamously long fingernails. Charles the Bold (also known as Charles the Rash, Charles the Terrible, and the last Duke of Burgundy) was the youngest son of Philip the Good and Isabella of Portugal. Around his neck is the emblem of the Order of the Golden Fleece, which he was knighted into as an infant by the order’s founder-- his good old dad, Philip. We’re willing to guess that Philip’s reported eighteen illegitimate children did not receive the same honor. Charles got his comeuppance though when he died a violent death in the Battle of Nancy in 1477. His body was discovered frozen in a river a few days later, his head split in half and his face maimed unrecognizably by wild animals. To top it all off, the poor dude’s crotch was full of spears. Let’s just say that his fragile masculinity just got a whole lot more…fragile. Even more disturbingly, his physician only managed to identify him by his incredibly long fingernails (can we call him Charles the Revolting?). On the bright side, the Netherlands became a major hub of Renaissance art and culture under Burgundian rule. Beginning in 1441, the sizable court of the Burgundy aristocracy was based in Brussels, which (as money tends to do) attracted a number of master artists to the area. 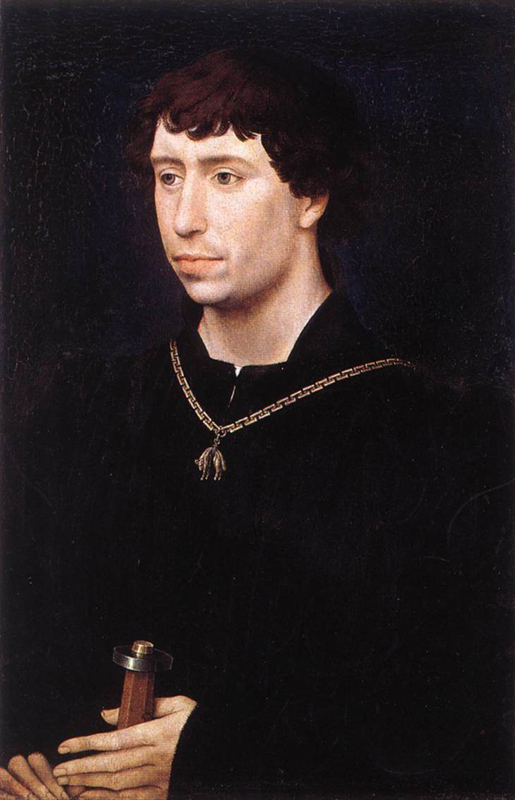 Brussels resident Rogier van der Weyden was commissioned to paint portraits of both Duke Charles and his father Philip, as well as several other members of the court. Cha-ching!